Well guys, I did it. I survived my first Valentine’s Day in the flower business. Thanks for all the well-wishes and encouraging messages over the last few days! Sorry things were a little quiet around here, but a long weekend of 12-hour days crammed with wrangling phones, cleaning flowers, and organizing hundreds of deliveries didn’t leave much time for blogging. We designed and delivered nearly 300 arrangements between Friday and Monday, and closed the shop on Tuesday to rest up and recover. Even though we worked our tail feathers off, I’m so thankful for a successful holiday! Every time I felt myself getting tired or overwhelmed, I thought of how incredibly blessed we are to be busy when so many people and small businesses are struggling right now. Did you get flowers for Valentine’s Day? I’d love to see what other shops around the country sent out on Monday. Email me a photo of your flowers from your sweetie, and I’ll put together a post so we can share the “love”! Send your photo to aprettypennyblog[at]yahoo[dot]com with Valentines Flowers in the subject line. >love the necklace! super cute! >So happy that you made it through your stressful time! 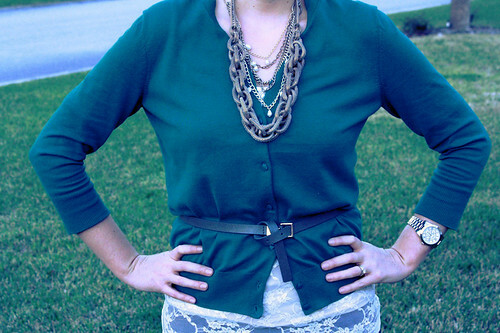 Loving this outfit…where is that fabulous necklace from? >It's actually two necklaces! One is Stella & Dot (available here: http://stelladot.com/sites/cathyhayes/productcatalog?page=productdetail&sku=N1009S) and the other is from Charlotte Russe — one of my go-to places for cute, inexpensive jewelry. >Oh my goodness, I love that necklace and the lace top! I'm so glad that you had a good holiday and you survived! That was smart to take off the next day too. You certainly look bright-eyed and well rested! Hope you're feeling good! >Congrats! Here's to many more! That necklace is just fabulous! And of course, so is the rest of your outfit! >Congrats for surviving your first year in the florist business Keira and I love your hair like that! >Surviving Valentine's Day and a great outfit to boot! You're making the rest of us look bad! >Congrats on surviving! I'm sure you were fantastic. >Yay, you're back! Glad you survived the Valentine's madness.What a gorgeous outfit on you – such pretty colors and lovely necklaces. >Congrats! That's really exciting, and I bet you were a rock star during the whole stressful process. And congrats on this cute outfit! 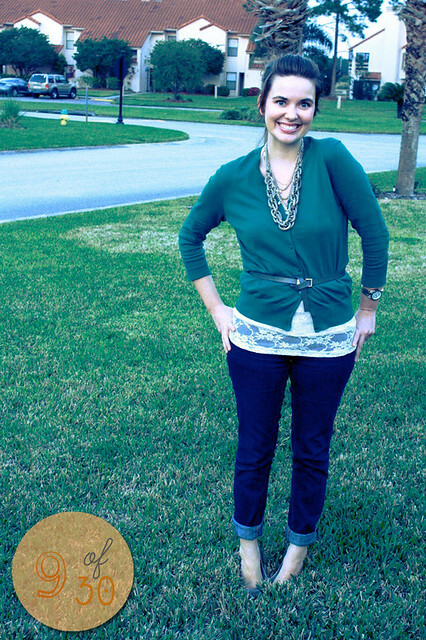 I love green on you, and that necklace is to die for. >Glad you made it through! love this outfit! >I'm glad your valentine's day was a huge success! !